Since I was a child. But I started to make some kind of serious pieces of art when I was 15-16. Just everything (including music, movies, photos), but some different situations of my life inspires me the most. Digital sketching/painting, because it’s easy to correct mistakes, and you don’t have to pay for the paper, paint, brushes and other materials. But I like to sketch on a traditional way too, and color the picture in Photoshop or SAI then. There are different feelings like passion, love… But my best artworks have been drawn when I was hating and suffering. It’s dark red, black and green, and the in-between tints of course. These are my favorite colors, and I really like to mix them. I’d like to improve my gesture and the way of coloring, especially the coloring. It’s doesn’t satisfy me anymore. No, art is not my main thing for this time. Q8: Describe yourself with 3 words capturing the essence of Natalie de Corsair. 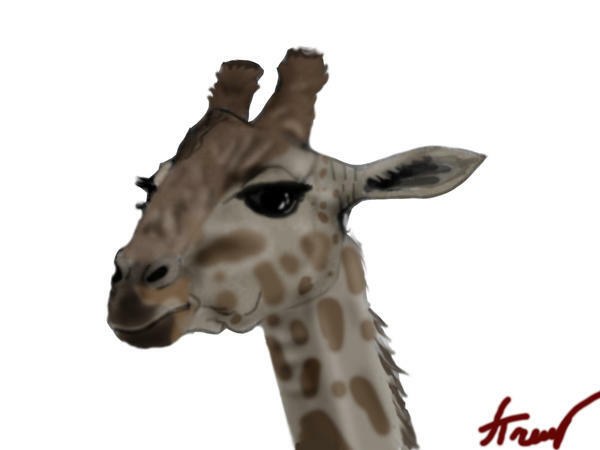 HERE oh God why xD I drew a giraffe on the piece of squared paper, photoed it on the phone and colored in Photoshop on the only one layer (because I didn’t know it could be more layers). It’s my hobby, the reflection of my mind and the way of sublimation my feelings.